Disclosure: Philips provided me with a Multicooker for recipe development at no cost to myself. I am charging Philips my usual recipe development/photography fee. An additional Multicooker for giveaway on Family Feedbag is also being provided by Philips at no cost to myself (giveaway in future post). Opinions are my own. Grab a napkin. The kitchen is the most innovative room in the house. Always has been. The job of feeding a family is never ending, so it's no surprise that home cooks have always been on the lookout for the next thing that will make getting dinner on the table a little bit easier, and perhaps a little more fun, without compromising the quality and flavour of what we're making. I love to cook, so I am not really into machines that will do it ALL for me. I still want to experience the sizzle, the boil and the steam of cooking. I like a quality tool that will simplify things a little, and maybe produce a little less mess. 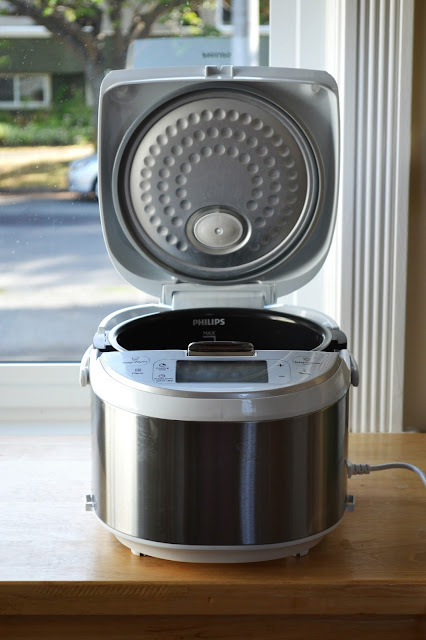 When Philips asked if I would try out their brand new Multicooker, I was at first confused. What is a Multicooker, I wondered? I asked Google and concluded that it's like a slow cooker. But better. The Multicooker has a Slow Cook setting, but it also has a Brown/Sauté setting (yes, you can brown your meat first in the same pot!) as well as settings for Rice/Quinoa, Risotto, Oatmeal, Bake/Roast, Boil/Steam, Stew/Soup and Yogurt. Yes, you can even make your own yogurt in this thing. Well, after using the Multicooker, I'm getting rid of my old slow cooker. I just don't need it anymore. 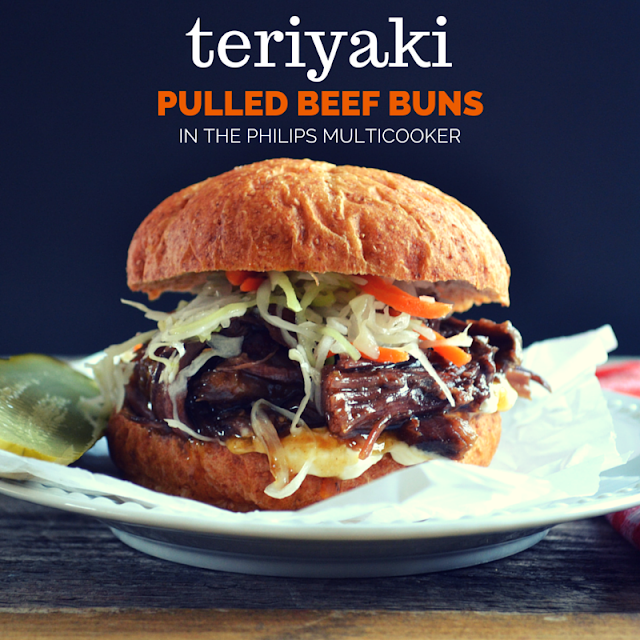 The first recipe I've created for the Multicooker is for these mouth-watering teriyaki pulled beef buns. Oh my word. So good. They're saucy and sweet and salty all at once. You could make these in a regular slow cooker, searing the beef first on the stovetop, slow cooking it, then finishing the sauce on the stovetop with the beef drippings at the end, and the results would be just as tasty. But doing it all in the same vessel is a time saver and a major mess saver. 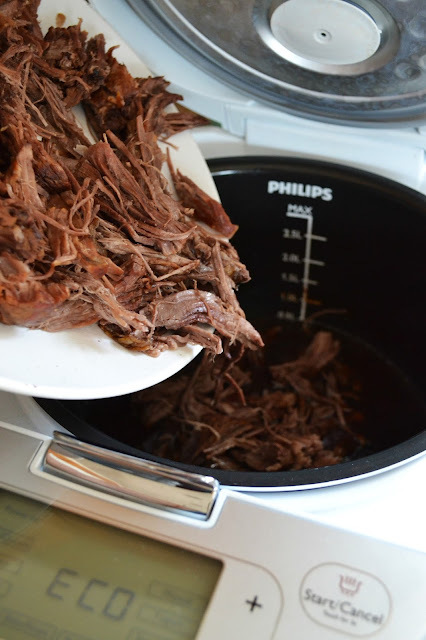 Plus, the Multicooker got the meat to pull-apart tenderness in just 3 hours. My slow cooker would never do it that fast. 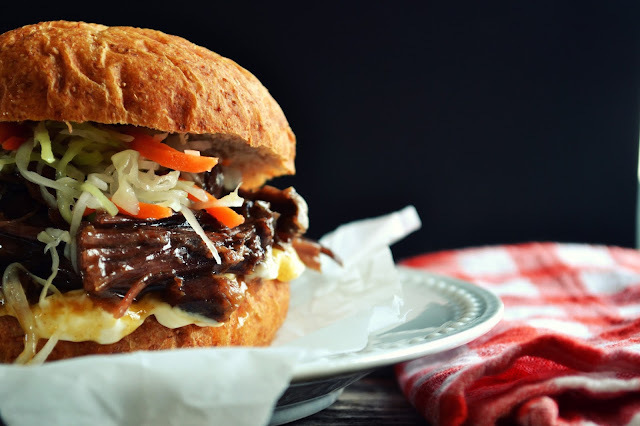 Get this scrumptious recipe below and come back soon when I'll be giving away a Philips Multicooker (retail value of $249.99) to one lucky Family Feedbag reader. Set the Multicooker to the Brown/Sauté setting. Add the oil then the pot roast. Allow the roast to sizzle 2 to 3 minutes per side, rotating until all sides are nicely browned. Set the Multicooker to the Slow Cook setting for 3 hours. Close the lid and go do something else while the roast becomes tender and deeply delicious. When the time is up, transfer the roast to a dinner plate and set aside. 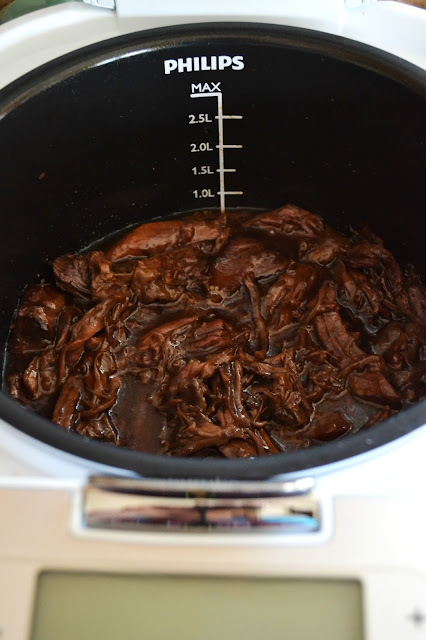 To the beef drippings in the Multicooker, add the soy sauce, brown sugar, honey, ginger and garlic. Set the Multicooker to Boil/Steam and bring to a boil. Meantime, in a small bowl, stir together the cornstarch and water. Once boiling, stir the cornstarch mixture into the sauce. Continue boiling until thickened, about 1 minute. Turn off the Multicooker. Remove any twine from the roast. Using two forks, shred the beef well. Transfer the beef back to the Multicooker. Stir to coat the beef in the sauce. Serve piled onto buns. 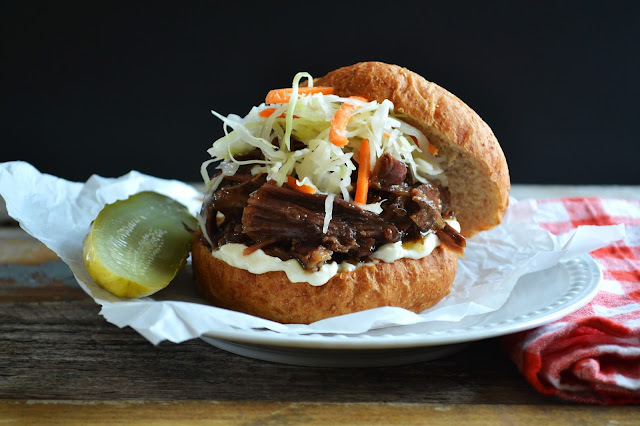 I like mine topped with crunchy coleslaw with a dill pickle on the side. What do you think of the Philips Multicooker concept? How would you use one? Stay tuned for a giveaway soon! I'm intrigued! 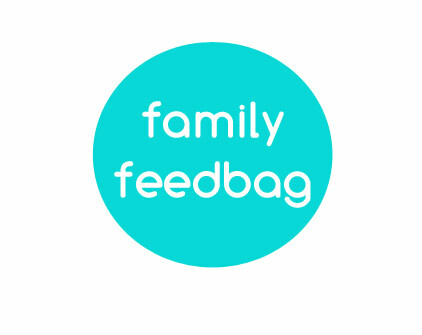 What are your thoughts on the capacity for a family? 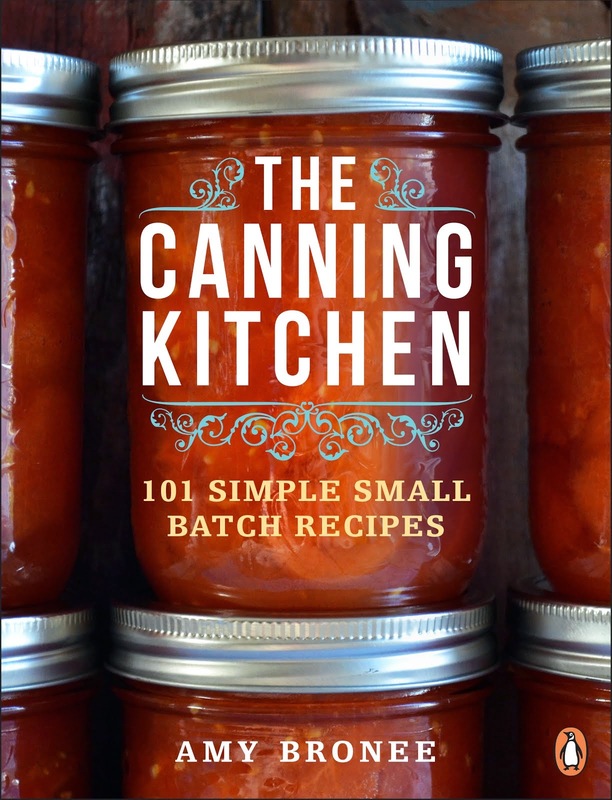 It seems smaller than your traditional slow cooker. I was worried about that too because I have a very large slow cooker, which I thought I needed with a family of four. It turned out I was never really satisfied with the results from it, and I think that might have been because it was operating with the bowl only half full most of the time. If it helps you visualize it, the Multicooker fits a whole chicken, which I think is just the right size for me. If you were doing large batches of things though, like a double batch of chili with leftovers for freezing, you might find it small. Hope that helps! I want one!! I love to cook but I have Rheumatoid Arthritis so cleaning loads of pans is very difficult for me. This would be a huge help!! The recipe looks wonderful. I like a little mayo, but you don't need to use anything since the meat is so saucy.